One of the hardest things about using Usenet is actually finding what you are looking for. All you need is a good search engine and a NZB downloader and you’re good to go! Binsearch is a Binary Usenet Search Engine. With this site you can search and browse binary usenet newsgroups. Binsearch indexes every binary newsgroup that is supported by our Best Usenet Providers. By default only the most 400 popular newsgroup are searched. You can Choose ‘search other groups' to search other 300+ newsgroups. Let's look at what a Usenet Search engine is, how it works and how good Binsearch is at doing its job. 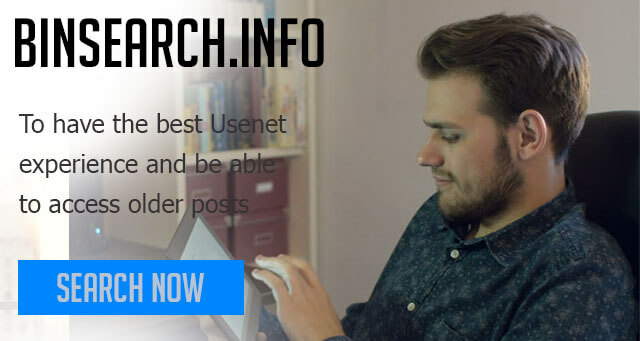 Binsearch or any other Usenet search engine, like NZB Index, are searching services for Usenet. Like Google is a search tool for the web, Binsearch looks up archives for Usenet forums and files. When you scan for a record on Binsearch, it just gives you results in the form of a NZB document. You can then utilize that NZB to download the records from a Usenet server. You should know that Binsearch does not host any files themselves, the files are hosted separately on Usenet servers. Binsearch just looks them up from these servers. Perhaps, this is the question. Sure, Binsearch exists and you know what it is but why do you need it? Well, if you have any intentions of using Usenet, and want to find what your look for, it will make your life easier. Even if you are using a client like SpotNet to look up message boards, they will not directly provide the NZB to you. Most likely, you will be given a link to one of these search engines where you can then get the NZB from. Moreover, you can use these search engines independently. To do this, you can search for files directly on the search engine and select files to download directly from here. Let’s take a closer look at one of the leading search engines for Usenet today-Binsearch. Binsearch, or Binsearch.info is currently ranked 3500 on the Alexa rankings for most used websites around the world. It is by far, the most used NZB search engine. It is loved mostly for its speed. It is super quick to return results and get the user what they need. SSL Website Access: Binsearch allows access to SSL websites. These websites have an extra layer of encryption and cannot be accessed from all search engines. With Binsearch, you do not get any results omitted due to non-compliance with SSL standards. Retention: As we mention before on Usenet.com, retention is one of the most important factors for a Usenet search engine. These are the number of days the files are kept track off. So a file older than the retention rate of a search engine will not be displayed as part of the search results. They update them regularly and you can see the retention levels for each newsgroup. These are various for many groups but are mostly standardized at 1100 days. That’s more than 3 years of retention time. While retention times go up to 2100 days for many engines, 1100 is suitable for the average user. Not to mention, Binsearch is working constantly to increase their retention rate day by day. Watch Release Feature: This is a fun quirk that you get with Binsearch. It is basically a tracking feature for upcoming release. So, if there is a file that you are anticipating and need it the moment it comes out, this feature is built for you. However, you need to be registered to use this feature. While not directly related to Usenet services, it is a fun little feature to have. Newsgroups: If you use Usenet, you will know that the real provision of content is through newsgroups. These are the file hosting services, so the more the newsgroups, the more the content, the more for you to choose from. Binsearch, at the time of writing, is affiliated with 3155 newsgroups. Binsearch not only has that, but in order to allow casual browsing of newsgroups Binsearch also listed down the top 400 newsgroups. Price: Last but of course not the least is the Binsearch pricing. Which is, free. Binsearch does not charge users any money for the services they avail. It is funded by advertisements. The advertisements are hardly noticeable or at the very least, bearable. They do not cause any interruption in using the website services themselves. Using Binsearch is easy. To start off, go to Binsearch.info and you’ll be encounter this webpage. Yes, it looks like a webpage from the past but this part of the reason why Binsearch is super light and quick. They do not have any unnecessary graphics or gimmicks to make the engine look pretty, they are all about results. As you can see, the main focus is on the search portion of the website. In the toolbar above you will see options for basic or advanced searching. We’ll stick to the basic search. The advanced search adds more fields to base result filtering on. In the search field, write what you are looking for and hit the “search” button. The settings for results per page and number of days to search are 100 and 1100 respectively. These are perfect for the average user and you do not really need to change these. For the radio buttons below these options, you may need to think a bit. If you are looking for a file that is fairly popular, then “search in most popular groups”. If your file is more on the exotic side then you may need to go with the latter option. I searched for “open office” and hit enter. The results I got are below. From these files you can easily work out which file is the one you are looking for. Once you have made this identification, click the check box on the right (there may be more parts than one to your file) and click the “Create NZB” button above. This will trigger a download of .NZB files. Note, these are not the actual files you want to download but sort of links to download them. These .NZB files will be opened and used to download the actual files using an NZB downloader like SABnzbd. As you will notice, even if you select multiple files, one .NZB is create for them. As mentioned before, this is one of the best features of Binsearch. Once this download completes, you file will be available in the location you had desired. It is also valuable to compare Binsearch with another leading search provider-UsenetServer Global Search. 1⦁ Price: One of the most distinctive features in both services is the price. While Binsearch is free, UsenetServer Global Server requires an account which is paid. However, it does mean no advertisements. Additionally, you even get Usenet Server and VPN services in your account purchase. You will need the Usenet server if you intend to use a client like SpotLite. The VPN service can also be utilized to maintain your anonymity online. So, both are at a tie here. It just depends what you are looking for. 2⦁ Retention: UsenetServer, because of being paid, offers 3377+ days of retention. That’s almost triple the retention of Binsearch. So if you are concerned with greater retention, UsenetServer is your best bet! Addtionally, UsenetServer will also allow you to check if a file is still available right off their platform! 3⦁ NZB Creation: UsenetServer does not offer NZB creation itself but returns results in NZB as well as ZIP formats. With Binsearch the NZB is created dynamically so .ZIP is not available. 4⦁ RSS: While this may not be relevant to all, it should be pointed out that Binsearch has RSS feed support while UsenetServer does not. So if you are a regular user of RSS feeds then UsenetServer might not be suitable for you. Regardless, of which search service you use, UsenetServer Global Search and Binsearch are good at what they do. They offer services to different kinds of users. You can choose whichever you like, according to your requirements. Wether or not you are a novice or pro at using Usenet, then you will stumble upon a similar search engine at one point or another. So, it is best that you have a grasp on them. We can help you, just check out our Best Usenet Provider Review.